Like most economists, I am strongly inclined toward free trade. I cringe to see the way free trade is under attack, from both parties, during this primary season. The two populist candidates are the worst offenders. Bernie Sanders, whom I support on many other issues   , goes off the rails when it comes to trade. Donald Trump, whose policy views are sometimes too vague to pin down, has made clear-cut opposition to “horrible trade deals” a centerpiece of his campaign. Nor is the pushback from the rest of the field as strong as one might hope. Hillary Clinton has changed her position on the Trans-Pacific Partnership (TPP), which she supported as Secretary of State, and runs away from her previous support for the North American Free Trade Agreement (NAFTA), which she liked well enough when her husband signed it into law. On the Republican side, Ted Cruz, Marco Rubio, and John Kasich all profess to favor free trade in principle, but when pushed, as they were during last week’s Republican debate in Miami, they quickly go on defense, hedging their support for trade with numerous “ifs” and “buts”. Let’s take a look at some of the candidates’ least defensible arguments against free trade, starting with Trump and moving on to Sanders. One of the main targets of Adam Smith’s Wealth of Nations, published in 1776, was the doctrine of mercantilism. Among other things, mercantilists argued that if your country brought in more gold than you paid out, you were a winner; if more went out than came in, you were a loser. When we run a trade deficit with China, we are not losing something, we are making a choice. Two choices, in fact. One choice is what kinds of goods to buy and whom to buy them from. If I buy a pair of made-in China boots, it is because I like the price, the quality, or both. If you tell me, “No, you can’t buy those boots, you have to buy those others,” I would protest. That would be a real loss—being forced to buy boots that (in my opinion) give less value for the money. The other choice reflected in a trade deficit is more subtle. When we run a trade deficit with China, we are, implicitly, making a choice between the present and the future. Right now, running a trade deficit allows us to consume more than we are producing, and in return, the Chinese get some money they can use to buy goods from us. But, instead of doing so immediately (in which case, trade in goods would balance), they take some our money and invest it in Treasury bills, which they can cash in to buy things from us in the future. Is it good for Americans, collectively, to consume more than they produce each year? There are credible American economists who think it is not, just as there are Chinese economists who doubt that it is good for China to churn out goods for others, while holding living standards down in order to amass mountains of Treasury bills. One thing is certain, though. We cannot not boost the chronic low saving rates of our households and government by starting a trade war with China. In a system of truly free trade and floating exchange rates like a Trump administration would support, America's massive trade deficit with China would not persist. On day one of the Trump administration, the U.S. Treasury Department will designate China as a currency manipulator. 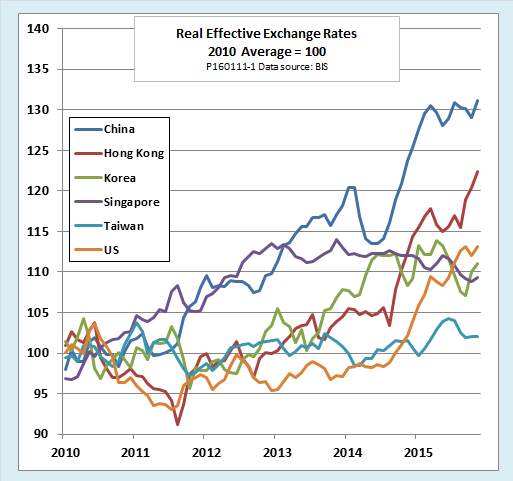 It sounds tough, but the charge that China’s policy holds the yuan at an artificially low value is badly out of date. 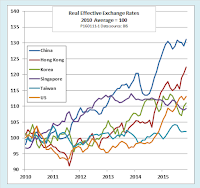 As we see from the following chart, based on data from the Bank for International Settlements, since 2010, China’s currency has appreciated by 30 percent, double the rate of appreciation of the dollar, and more than Hong Kong, Singapore, Korea or Taiwan. For conclusive proof that China is not holding its currency at an artificially low value to gain a trade advantage, all we have to do is look at the behavior of its foreign currency reserves. A country that purposely undervalues its currency does so by buying up foreign currency in exchange for its own. In the bad old days, when China’s foreign reserves were soaring, the charge of currency manipulation had some credibility. However, since early 2014, China’s currency reserves have plunged. They are now more than 20 percent below their peak, and falling fast. (You can find a chart with the latest data here.) The fact is that China is now doing everything it its power to prevent the yuan from depreciating. To the degree it is manipulating at all, it is manipulating its currency upward. Do imports really kill jobs? It is time to bring Sanders into the conversation. Like Trump, he has made the claim that trade kills jobs a standard part of his campaign rhetoric. Trade with Mexico, he says, has cost 800,000 jobs and trade with China, millions more. Commentators, drawing on exit polls, have attributed much of Sanders’ appeal, including his surprise win in Michigan, to his antitrade stance. Politifact has examined the 800,000 job claim and ruled it to be “mostly false. That is hardly surprising, since standard economic theory predicts that trade should have no effect on total employment. In the long run, averaging out business cycle effects, the number of people at work is determined almost entirely by demographic factors, such as population growth and age structure, and social trends, such as the changing role of women in the labor force. 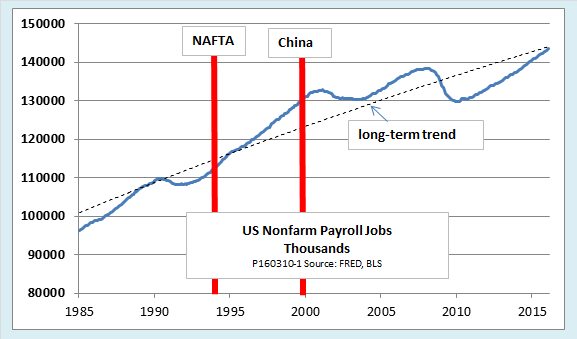 The following chart, which shows job trends over the past thirty years, is consistent with that orthodox conclusion. The red bars show effective dates for NAFTA and normalization of trade with China. As we see, the US economy has added about 50 million jobs since 1985. The pattern of job growth is irregular—the number of jobs falls during recessions and grows during recoveries—but as of 2015, the total number of jobs is right where the long-term trend indicates that it ought to be. There are no visible breaks at the red lines. On the contrary, NAFTA came into force near the beginning of one of the greatest job booms in US history. 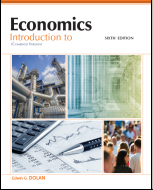 What standard economic theory does predict is that trade can affect the structure of employment. Countries export things in which they have a comparative advantage and import things in which their trading partners have the advantage. The US has a comparative advantage in aircraft, financial services, farm products, and many other goods. American exporters, on the whole, have been hugely successful. Exports as a share of US GDP have grown from 4 percent in 1960 to more than 15 percent today. At the same time, China and Mexico have a comparative advantage in manufactured goods that require low to moderate levels of skill, and their exports to us have grown, too. The tendency of trade to draw labor and capital in each country into the production of the things it makes best is the fundamental source of its benefits. Yet, although everyone shares in those benefits through lower prices, some workers lose their jobs and some companies lose their customers to competition from imports. We can see that from the next chart, which shows that US manufacturing employment has declined by a third since its peak in 1979. 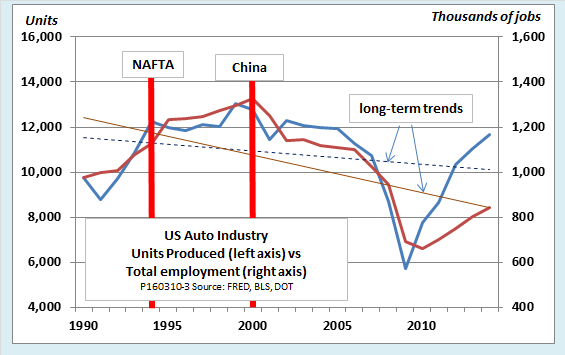 Even in this chart, NAFTA has no visible effect. The downward trend in manufacturing jobs was already underway in the 1980s. Although factory jobs increased a bit during the dot-com boom of the 1990s, they fell during the housing boom of the early 2000s, and they have recovered only partially as the economy has shaken off the worst effects of the Great Recession. 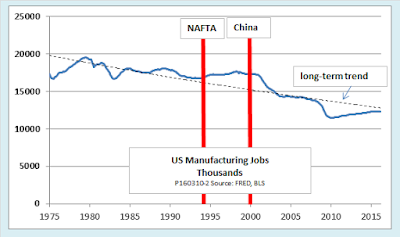 We should remember, though, that trade has not been the only cause of declining manufacturing employment. Rising productivity has also played a role. 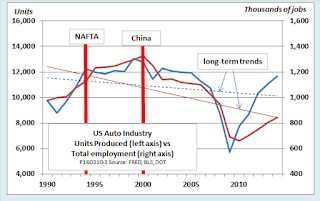 For example, if we narrow our focus to the auto industry, we see that after a big dip during the recession, US auto output has recovered to its pre-NAFTA level. Yet, because productivity has risen, the number of automotive jobs remains 40 percent below the 1994 level. Presumably, productivity would have grown even faster if competition from imports had not put downward pressure on autoworkers’ wages, easing the pressure for ever-greater automation. In short, there is a story here about trade and jobs, but it is more nuanced than the one Sanders and Trump tell. Politicians may promise that erecting barriers to trade will bring back both the factory wages and the jobs of the past, but that is fantasy. Protectionism might raise the share of manufacturing in US GDP, but in many cases, the beneficiaries would be robots, not flesh and blood workers. And in the process, the three-quarters of the labor force that would remain in the service sector, many of them working for low pay, would find their standard of living further eroded by higher import prices. There is one more thing that bothers me about the war on free trade, especially, as it waged by the political left. Bernie Sanders is a progressive. “The issue of wealth and income inequality,” he writes, “is the great moral issue of our time; it is the great economic issue of our time; and it is the great political issue of our time.” But there is one aspect of inequality Sanders talks less about—the global inequality between rich and poor nations. But Sanders leaves out an important part of the story. What do Mexican autoworkers earn today? Reuters reports that they earn $8 to $10 per hour, including benefits. It seems that NAFTA has helped to raise the wages of Mexican autoworkers by as much as forty-fold over twenty years. What can a progressive not love about that? Surely, when Sanders opposes NAFTA, he does not really mean that he wants to send Mexican workers back to their cardboard shacks. Conservatives, too, ought to welcome Mexico’s growing prosperity. GOP candidates, Trump foremost among them, talk endlessly about border security. They all agree that something has to be done about the northward flow of immigrants. But just who is crossing our southern border these days? It turns out that under NAFTA, illegal border crossings by Mexicans have slowed dramatically. A 2014 study from the Pew Research Center shows that as wages and working conditions have improved, the number of border aprehensions of Mexicans illegally entering the US has fallen from a million and a half per year in the 1990s to about a quarter million. Honduras, Guatemala, and El Salvador are now the sources of a majority of illegal immigrants. Another Pew study shows that more Mexicans, legal and illegal, are now returning to their home country from the US each year than are making the trip northward. What can a Conservative not love about a more prosperous southern neighbor? The bottom line is that I am disappointed in Sanders’ stand on trade. I can understand his sympathy with those who have been displaced from good jobs that they thought were secure. But, if we are going to help them, tariffs and other broad protectionist measures are not the way to go. In case after case, economists have found that the costs of such measures are simply too great. For example, one study found that a tariff imposed on Chinese tires in 2009 saved 1,200 American jobs, but did so at a cost to $1.1 billion in higher prices to American consumers. That comes to more than $800,000 per tire worker’s job. And it does not even try to account for the fact that consumers, after paying more for tires, had less to spend on other goods, meaning that American jobs in other sectors were threatened. It would be far more reasonable to employ direct forms of aid. Retraining, adjustment assistance to workers or employers, income support, or wage subsidies are some of the possible remedies. None would come close to costing $800,000 per job. I am less surprised by Trump’s support for high tariffs, since, in other cases, too, he has proposed policies that are superficially plausible, but do not stand up to scrutiny—a wall to keep out Mexicans who are now headed south, rather than north; a blanket ban on visas for Muslims as a tool for combatting terrorism, and so on. Some commentators tell us not to get excited. Presidential candidates go protectionist in every election season, they say, and then support free trade once they are elected. They point out that President Obama, who imposed the tire tariffs and bragged about them in the 2012 election year, later negotiated the TPP and saw the Korea-US Free Trade Agreement (first signed by George W. Bush) through its implementation phase. Let’s hope that, whoever is elected, those optimists are right. Thanks for posts like these. You economists need to do more to calmly educate the public so they will not get duped by politicians. This was a very succinct and sensible essay on world trade. 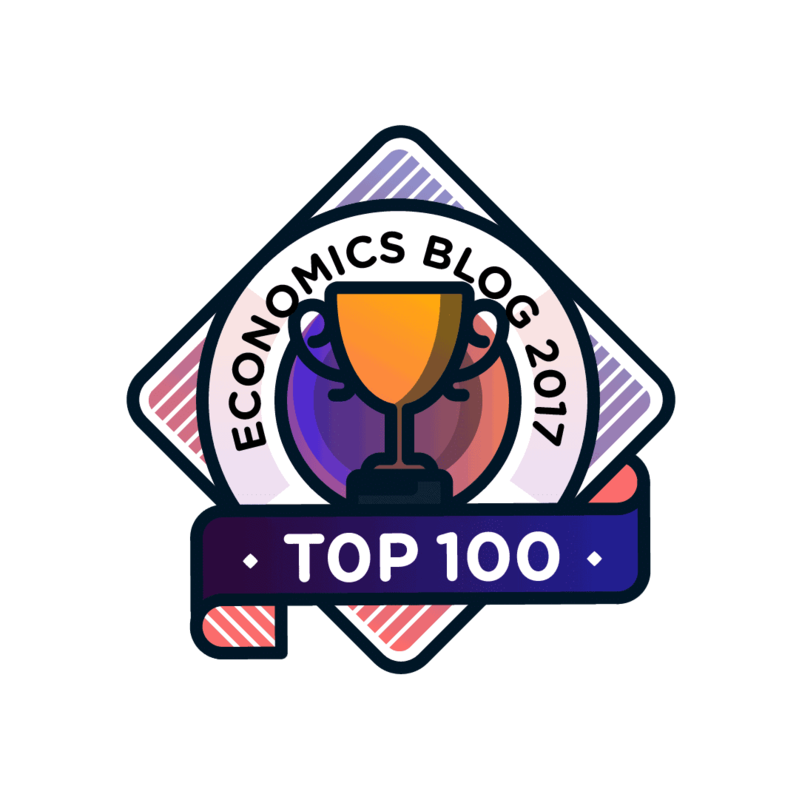 We need more economists doing what you are doing and we need more economists getting involved and given more attention in these political battles. For example, I would love to see a panel of economists politely play devils advocate with the economic ideas of political candidates. Again, thank you very much. "There are no visible breaks at the red lines." Actually, isn't there a small break about 1 year after NAFTA and a big break about 1 year after China?